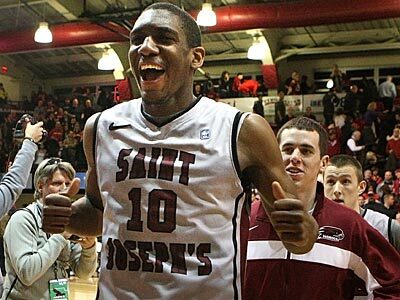 Led by 14 points by Langston Galloway, including a pair of clutch free throws with 1.4 seconds remaining, Saint Joseph’s defeated Xavier in the first round of the Atlantic 10 Tournament in Brooklyn. The Hawks blew a late five-point lead and were down by one until Galloway’s free throws. Isaiah Philmore missed a layup at the buzzer that would have won it for Xavier. Both teams shot poorly from the field in the first half but the game heated up down the stretch. Staten Island-raised Halil Kanacevic led a Hawk surge before fouling out. He ended the game with 11 points, 8 rebounds, and 6 assists. His back-court mate Ron Roberts finished with only 8 points and missed three key free throws near the end that nearly cost St. Joe’s the game. In what was almost his last game in college, senior Tay Jones continued his slump with a 1 for 10 night from the field scoring 11 points, mostly on free throws. Despite his struggles, Jones surpassed Ahmad Nivins for third place on Saint Joseph’s all-time scorers list. The Hawks will now face VCU at the Barclays Center on Friday.